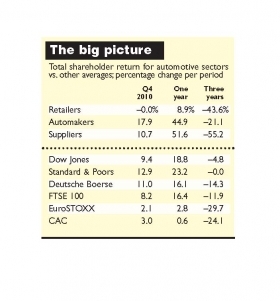 The pace of recovery slowed in the final quarter of 2010 for two of the three automotive stock groups followed by the Automotive News Europe/PricewaterhouseCoopers Transaction Services Shareholder Value Index. Automakers fared well on average, with shareholder value increasing by 17.9 percent. This was close to that seen in the preceding quarter. The growth in shareholder value for suppliers however, at 10.7 percent, was halved, while retailers slipped back to zero growth. 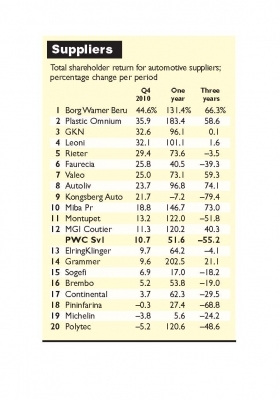 The Q4 gains by both automakers and their suppliers compared well with leading share indices. Carmakers beat all the leading U.S. and European market indices, while suppliers outpaced the Dow Jones, the FTSE 100 and France’s CAC40. "Automakers demonstrated a significant turnaround in 2010 compared with the lows of 2009, driven by increased investor confidence, investment in new models and green technologies. The signs for 2011 are positive, although economic conditions in Europe will remain challenging," said Jason Wakelam, leader of PwC UK's Automotive Transaction Services. A powerful 64.5 percent increase in shareholder value at Porsche Automobil Holding SE secured the top spot amongst automakers in the fourth quarter, according to the Automotive News Europe/PricewaterhouseCoopers Transaction Services Shareholder Value Index. It was a welcome return to form for the company that had been just one of two to achieve double-digit growth in the first quarter of the year. The performance came on the back of better-than-expected profits in the year to end last July, along with a strong 86 percent increase in unit sales in the three months August to September and a corresponding 80 percent growth in revenues. Porsche is confident of double-digit return on sales, with the Cayenne SUV, its top-selling model, and the four-door Panamera making significant contributions to this. Porsche was followed by Fiat S.p.A., whose fourth quarter 36.3 percent growth in shareholder value extended its 32.9 percent increase in the preceding quarter. The gain was attributed to anticipation of the splitting of Fiat’s car business from its various other divisions on Jan. 3, 2011, and last year’s acquisition of 20 percent of Chrysler Group LLC. Reflecting the overall improvement in the automaker sector, Volkswagen AG achieved 31.0 percent gain in shareholder value, while double-digit performances were achieved by Renault SA, PSA/Peugeot-Citroen SA and BMW AG. 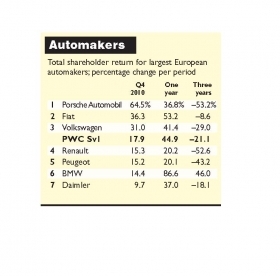 "While the increases in shareholder value indicates a partial return to form for European auto makers, it remains to be seen what impact government austerity measures will have on consumer spending in 2011," cautioned Jason Wakelam, leader of PwC UK's Automotive Transaction Services. The auto industry’s drive to improve fuel economy and lower emissions helped lift ignition specialist BorgWarner Beru Systems GmBH from 15th place to first in the Automotive News Europe/PricewaterhouseCoopers Transaction Services Shareholder Value Index’s list of 20 European partsmakers. The now fully owned Ludwigsburg, Germany,-based subsidiary of U.S. parts supplier Borg Warner Inc., Beru was tops with a 44.6 percent gain in shareholder value in the fourth quarter. French front-end maker Plastic Omnium Co. led the list in the first quarter of 2010 but only managed 18th place in the third quarter. But with 78.6 percent growth in the final three months of the year it rebounded into second place. Indeed, there was considerable volatility in performances throughout the list between the third and fourth quarters. The companies that fell included Italian coachbuilder Pininfarina S.p.A., down from first to 18th; seat maker Grammer AG, down from fourth to 14th; and brake systems specialist Brembo S.p.A., down from sixth to 16th. Going in the opposite direction where general engineering and drivetrain company GKN Plc, which rose to third from ninth, while exhaust, seating and interiors maker Faurecia SA of France jumped to sixth from 13th. 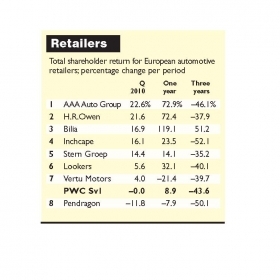 AAA Auto Group NV managed a strong 22.6 percent performance in the final quarter of 2010 to finish the year at the top of the Automotive News Europe/PricewaterhouseCoopers Transaction Services Shareholder Value Index for retailers. Operating new and used vehicle sales subsidiaries in nine central and eastern European countries, the group achieved record sales growth of 24 percent in the last quarter of 2010. In a statement issued in January, the company said the recovery had been seen not only in the Czech market, where growth had been 17 percent, but even more so in the Slovak market, where sales grew by 45 percent. UK luxury car specialist H.R. Owen Plc recovered from a third quarter 6.4 percent decline in shareholder value with a 21.6 percent gain in the final quarter. The third-quarter sector leader, Swedish dealer group Bilia AB, maintained momentum, albeit at a somewhat slower pace, with a fourth-quarter shareholder value gain of 16.9 percent. Firmly against the trend, however, Pendragon Plc was the only retailer on the list that failed to achieve growth. Its value to shareholders fell 11.8 percent in the last quarter, extending the 7.6 percent decline of the preceding three months. Pendragon, which operates 300 franchises across the UK, said last October that it was “cautiously optimistic” about hitting its full year profit expectations. "Despite positive signs from some of the major European players, retailers must continue to focus on used car margins and levels of aftersales income in order to generate shareholder value in 2011," said Jason Wakelam, leader of PwC UK's Automotive Transaction Services.